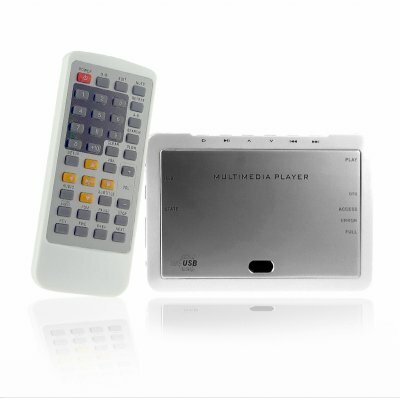 Successfully Added DivX Multimedia Player HDD Enclosure - 2.5 Inch IDE to your Shopping Cart. High capacity IDE 2.5 storage and multimedia player for your downloaded media files, and featuring a great array of no conversion played formats such as DIVX. Other features that set this HDD media player apart is its AV VGA and CVBS out for connecting to great quality screens, COAXIAL 5.1 Digital OUT for home theater system for surround sound digital effects, easy to use and powerful internal menu options, and USB OTG downloading for instantly recording digital files from USB devices direct to the hard drive. Affordable, powerful, and sleek, this HDD Enclosure and media player is perfect for taking you media files off the computer and playing them with the best possible quality. Note: This product is not sold with a HDD (hard disk drive) included. You will need to purchase a hard disk separately. The HDD will also need to be formatted for the enclosure to address it..